Time to take a look at one of our favorite Red Cap cards through the “real-life” lens! Our Life In posts are some of the most fun to play with and this one was just as sweet. 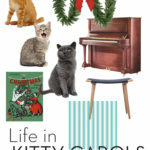 Kitty Carols by Christian Robinson for Red Cap cards has been making holiday smiles for years, and today is no different. Check out the fun we had below! • Three little kitties required for this scene: one grey, one striped, and one orange. Fun fact: most orange cats are male! • Some boughs of holly. Or in this case, fir. • A sweet, mid-century piano stool, but you’ll have to custom cover this one with that blue pin stripe! • An upright piano, of course! 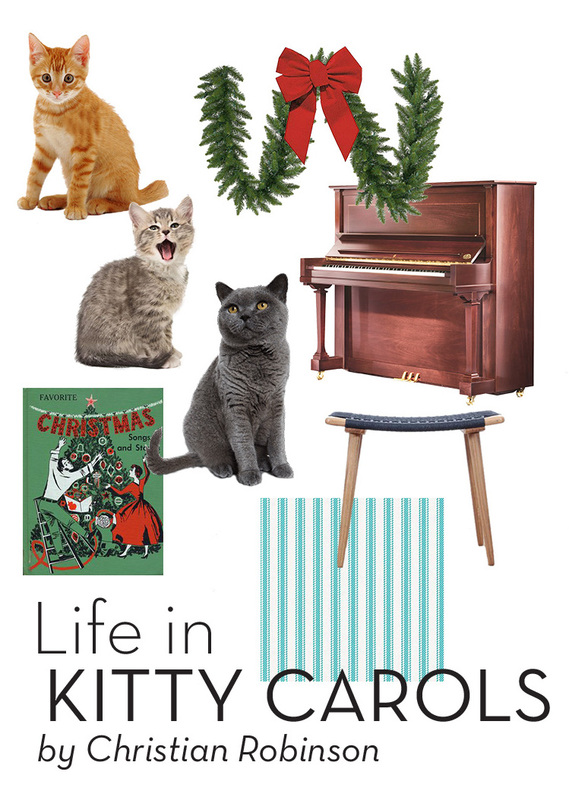 • A vintage, holiday piano song book. How long has it been since we did a “Life In…” post?? Quite a while, from our standards. So we thought we'd jump right back into it with one of our newest designs from Red Cap artist, Lizzy Stewart: Life in Father's Day Trumpet. You've got a little under three months until Father's Day comes around, but who says we can't celebrate early? And with wonderful woodland creatures? Check out below what you'll need to pull off Life in Life in Father's Day Trumpet. • Hey Dad–got a beard? Dye it red. Don't have one? Grow one! • Trumpet your way to the best Father's Day you can make. • Bluebird on your shoulder! • Hipster dads wear suspenders. Usually for our Life In posts, we pick and choose real-life items that allow you to see life through a “Red Cap viewfinder” of sorts. This time, however, it's on you! 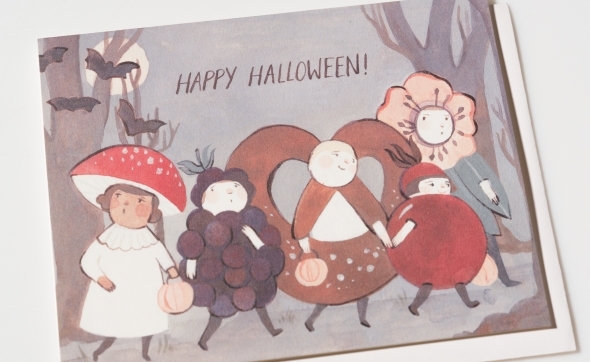 Halloween is on its way and adore this card by Kelsey Garrity-Riley. Making costumes is so much more fun than buying (if you've got the time and skill!) so we thought we'd gather up the info to let you really “live in” Halloween Kids! Gather up five kiddos and make this card come to life using the tutorials we found below. Happy Halloween! It's been a while since we've done a “Life In…” post, and we are oh-so-delighted to add a new design to the list. Lesley Barnes's newest collection for Red Cap is a fan favorite and we couldn't wait to bring it to life with Two Kids and a Lion. Now, let us warn you that bringing a lion to a birthday party is probably a bad idea. That is, unless you're Melanie Griffith. Have you seen Roar? Actually, no. It's still a bad idea. So let this be the closest that you get to a jungle party. • Happy Birthday! As a nod to our new foil collection, we wanted to include these Gold Foil festive balloons for a perfect “happy birthday” decoration at your party. • Stripes-a-go-go! Grab a paper party hat for you, your pals and your lion. • Don't forget your party dress and a slice of cake. What's a party without cake?? From Lesley's work on “The Animal Zoo” by Gabby Dawnay for OKIDO Magazine. • Can't have enough balloons. No siree bob. 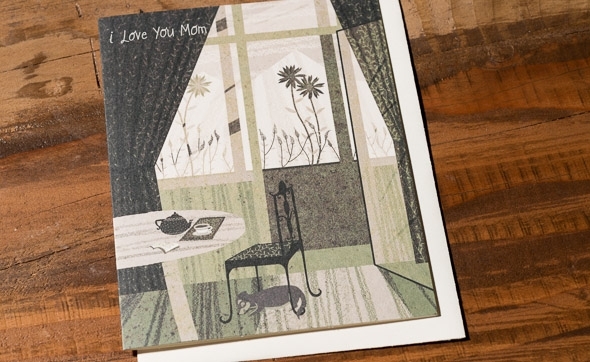 Grab your card by Lesley Barnes on our website, here. Have fun…ROAR! Do you have any vintage collections? 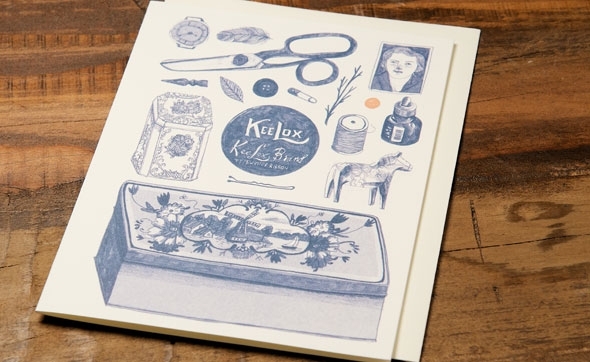 We love this little still life illustration by Red Cap artist, Lizzy Stewart, called Kee Lox, named after the pictured typewriter ribbon. 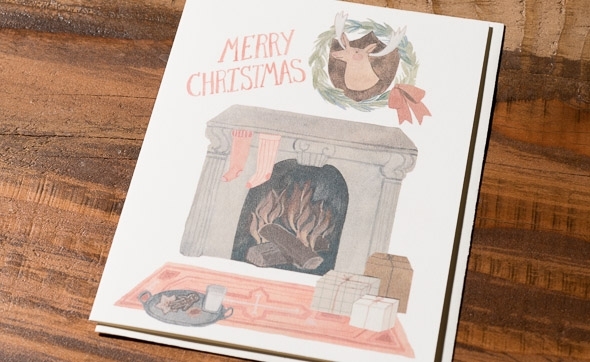 A little collection of vintage odds and ends–so delightful, and just perfect to be featured as our latest Life In… collage, imagining some of our card designs as real-life scenes. 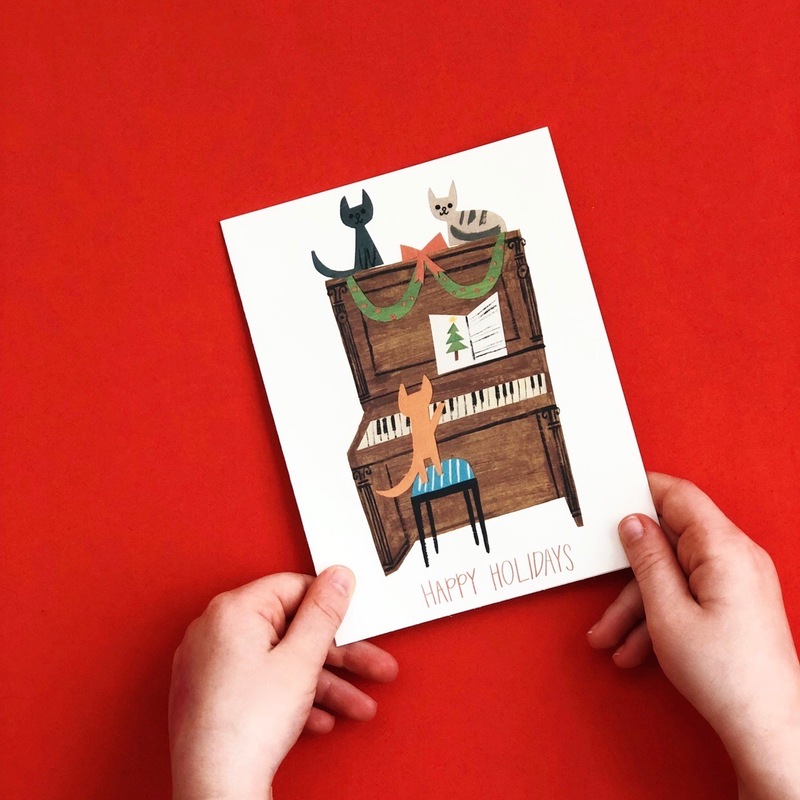 To see this card on our website, click here and check out our Artist Spotlight interview with Lizzy, here. Okay, guys–which card should we do next? 1. Pick your pie and cider apples in style. We love this modern stepladder from Yoox.com. 2. Decorative gourd-ing in stripes! Hip, stripey shirt from Joe Fresh. 3. Whippet, whippet good. Don't forget your favorite buddy! Pups love jumping around in fall foliage too! 4. Make sure you chop up some wood before it gets too soggy out there. Mmmm cedar. 5. The most stylish chopping axe you can possibly find: the American Felling Axe from Best Made Company. Comes in many styles and colors! 6. A sea of flannel. It's important. 7. Don't forget your knit Steve Zissou beanie! It's a must-have. (For most seasons, really). 8. Rake up those leaves, then ruin it by jumping into the pile and making a mess! You'll love it. 9. The guest of honor. Visit your local pumpkin patch for a few fat, orange friends. 10. Last but not least, don't forget the apples! It's the tastiest season and oh-so-fun to pick yourselves. Call us when you've baked a few pies. Oh, how we love our “Life In…” posts. If “Life in Teacup Cat” didn't satisfy you, we have a new still-life in honor of the newest member of our Red Cap family: Nicholas John Frith! It's birthday time–we're sure you know someone who was born in September! Get lost in this collage for “Life in Blowing Balloons” and grab your card here. • Down to party business: grab a black cone party hat for a sophisticated affair. Bonus if it has a tie-string. • This party has a very specific color palette. If you want to be authentic, better get to painting that party room! • Last but not least, stripey fun! Try this shirt on for size. These “Life In” posts are so fun to make! This time we wanted to play around with Anke Weckmann's whimsical sweetness in her Teacup Cat birthday card! Everyone needs a bit of silly whimsy in their day! 1. Toot Sweet Large Aqua Stripe Plate from Meri Meri. Makes the perfect backdrop for a cat in a teacup, right? 2. No party would be complete without the cupcakes! Try these Ultimate Chocolate Cupcakes from Brown Eyed Baker. 3. A stripey touch: Teal Stripey Cupcake Liners from on Etsy. 4. Fiesta ware! Grab a Flamingo teacup from Everything Kitchens. 5. Don't forget the kitty! Lots of these guys waiting at your local shelters for a cupcake to be placed lovingly on their head. 6. Last but not least: the perfect candle. Find these at Bake It Pretty. Grab your Teacup Cat in our shop section, and check out more work by Anke Weckmann on her artist page. Did you happen to see our first “Life In..” post? If not, make sure to click over to check out “Life in Sarah Burwash's Picnic.” We love entering whimsically into an illustration and imaging what the scene would be like in reality! Today, we're focusing on our brand new artist, Josie Portillo, and her piece “Mom's Chair.” So cozy up, grab a cup of tea and enter Josie's serene world, illustrated just for Mom! 1. Cozy for any room–the Indigo Stripe Rug from Crate and Barrel. 2. The chair itself! This vintage wrought iron dining chair will do the trick, from Verdibou on Etsy. 3. Journal or novella? You decide! 4. A lovely Salvaged Wood Dining Table for tea and talks, from Modern Furniture Warehouse. 5. The cutest, sleeping pup at your feet! Find your new forever friend at your local shelter. 6. Clean and simple: a white ceramic tea cup. This one, from Enjoying Tea. 7. And last but not least, a classy Cast Iron Teapot. This one from Nabu 93. 1. The first thing you'll need: a good ole' traditional picnic basket. This one looks like it would sneak a few bottles of Prosecco! 2. Plus, the perfect picnic statement: a stripey, boatneck shirt for a mid-summer European look. 3. 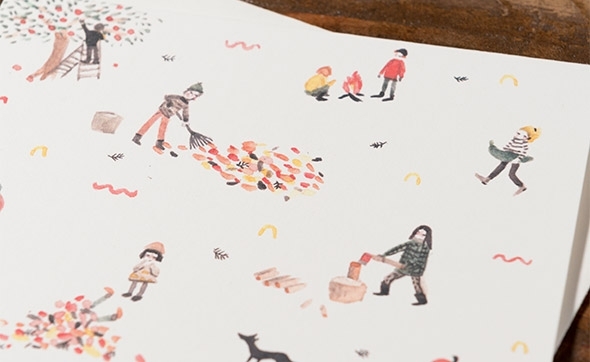 This pattern brings it all to life in Sarah's illustration: a must-have for all picnics. 4. Ahh and the traditional picnic charcuterie: hot dogs on the grill! Bonus: these dogs come with a croissant! 5. If you're a bit more subtle in your picnic blanket packing, or prefer to layer textiles–we love this Dutch blanket. 6. And last but not least, a favorite piece of the illustration: the cute little picnic bikes. This is a fun Italian beach bike, via Babble/Ariel.com.